I’ve felt truly posh on just a few occasions in my life. Clinking champagne flutes (albeit plastic ones) during the intermission of “Swan Lake” at the Met, and taking a riverboat cruise down the River Thames are two that stand out, but now I can feel like a cast member of Downton Abbey any day of the week from 2-5pm at the O. Henry Hotel. My friends have been encouraging me to try this since I arrived in Greensboro last summer, and they were right: Afternoon Tea is one of the best ways to spend your day, and it’s a wonderful excuse to wear that dress or those cufflinks you’ve been saving. My tea party partner and I chose the Wedding White Tea, with notes of lemon and vanilla. A delicate tea kettle arrived, and we each got about 4 cups in our petite mugs. Dishes with lemon wedges, brown sugar cubes and cream are wonderful compliments, but my American palate didn't find any additions necessary. There are several nibble options, but the O.Henry Tea Selection gives you the best bang for your buck, and a little taste of everything you could ever want at a tea party. My absolute favorite was the Vanilla Scone, served warm with Clotted Cream and Lemon Curd. Absolutely scrumptious. This beats the one time I had "real" tea and scones in London. Savory items don’t disappoint. Cucumber Sandwich with Dill Cream Cheese on White Bread is light and enjoyable, for someone who doesn't consider herself a "sandwich person." The Rosemary and Cheddar Madeleine is perfectly salty, and could have been larger for my sake. Other savory options include a Truffled Mushroom Quiche, which I enjoyed at brunch a few months ago, a Ham and Brie Croissant with Fig Mayonnaise and a Spicy Cheddar Wafer. The tray of sweets was a dream come true. Lemon Squares are tart, and fill a buttery shortbread crust that’s so good, in fact, that you're also served a separate wedge of it. Slightly salty and rich – this is proof that simple, good ingredients can create perfection. Yellow cake is dipped in chocolate and rolled in coconut - reminiscent of, but better than what your mom used to pack in your school lunchbox. The sweet that takes the cake, if you will, is – drumroll, please – the Strawberry Almond Macaron filled with a luscious buttercream frosting. The meringue cookie had notes of Marzipan, which added to the chewy and slight nuttiness of the treat. I would eat these every day. Upon leaving, we were offered a fresh to-go cup, each with our own teabag. I’m telling you, this is royal treatment. 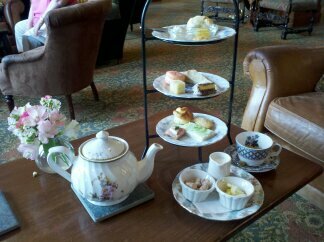 Get your pinkies up and head to the O.Henry for tea. They even offer a split of Prosecco for an additional $8. It doesn’t get any better than this.